This bright pink stone of divine love is known for its subtle beauty. Morganite belongs to the Beryl family and is also known by the name of ‘Pink Emerald,’ ‘Pink Beryl’ and ‘Cesian Beryl.’ Crystals from the Beryl family also exist in several other colors including blue, green, red and golden. Morganite was named after the great American gem collector and financer J. Pierpont Morgan. An interesting fact about this stone is that it reveals a bright red fluorescent color when exposed to x-ray; however, when the x-ray source is turned Morganite does not release phosphorescence. Morganite is not the traditional birthstone of any month; however, it is the natural birthstone of the people born in Autumn. It is also the zodiac birthstone of people born under the sign of Taurus. The chemical name of Morganite is aluminum silicate. It has a hexagonal crystalline structure with a transparent appearance. Large deposits of Morganite are found in granite pegmatites, and sometimes it occurs in combination with other minerals like lepidolite, garnet, tourmaline, and beryllonite. Due to its hardness it is also found in alluvial and eluvial deposits. Finest Morganite crystals are obtained from Brazil. In addition to that, North Carolina, Madagascar, Maine, Connecticut, California and U.S.A. are famous for morganite’s depositions. The largest specimen of Morganite found up till now was obtained from the Bennet Quarry of Buckfield in Maine. 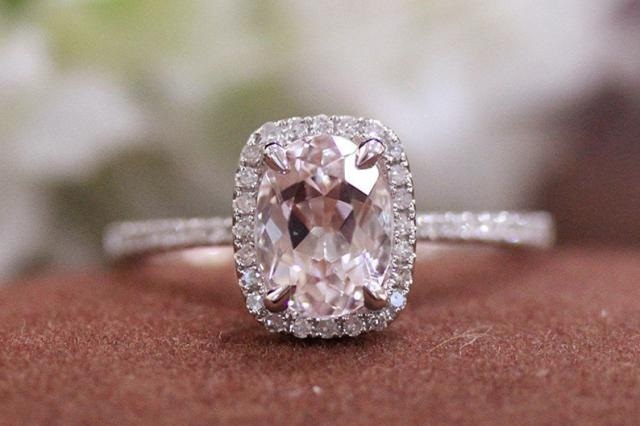 The first ever Morganite stone was discovered in 1990’s in Madagascar and Carolina. Initially it was not recognized as a separate gemstone; in fact it was considered a subsidiary of Beryl. In 1911, it was given the status of ‘Morganite’, the separate gemstone. Ancient Romans used to believe that all crystals of Beryl have aphrodisiac properties i.e. its wearer will experience enhanced sexual desires and evoke romantic feelings in the partner. Morganite is accredited with the Phoenician goddess of love, fertility and war, Astrate. She is also recognized as the Queen of Stars and helps troubled lovers with their relationships. Besides that, all crystals of Beryl are used to honor the Sumero-Babylonian goddess of chaos, Tiamat. It is a common belief that she was the main energy behind the formation of heaven and earth. In some cultures, this goddess is represented via dragon or serpent. People seek her help when they are facing mental challenges. Morganite is helpful for people who want to overcome anger, fear or resentment. It helps people get in touch with their deep seated emotions and needs, and makes them emotionally strong so that they can tackle their emotional problems healthily. In short, it stabilizes emotions and promotes feeling of love and happiness in people. Stabilized emotions are the basis of healthy relationships; therefore, it can also be said that Morganite indirectly improves relationships. It is also believed that the energy of morganite’s crystals can attract one’s soul mate and deepen the feelings of love in an ongoing relationship. Its mystic energies can help grieving people to get over the loss and accept reality. Thus, the frequency of Morganite is an excellent emotional healer.